The lake gazebo is 13 m in diameter. 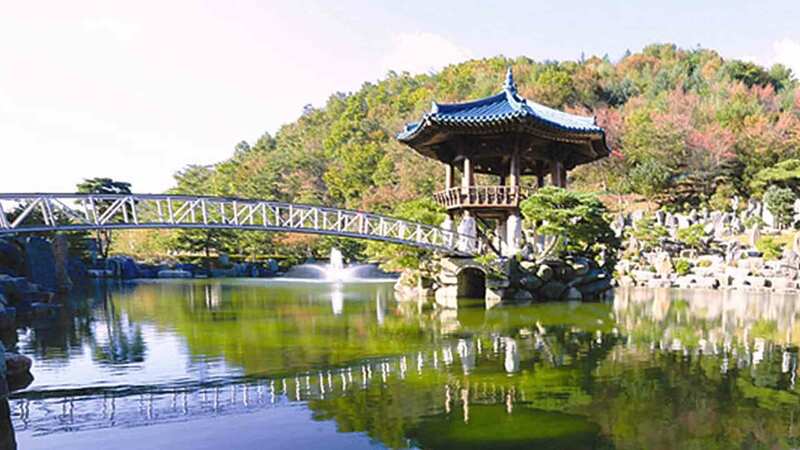 It is Korea’s biggest and most beautiful gazebo. Its pillars are 1.5 m thick, and its size is so magnificent that a whopping 100 people sit in it! It is a gazebo that we constructed on a grand scale. You will rarely come across a gazebo like this even if you search the whole world. The lake gazebo has nine stone pillars with animals engraved on them, and eight of them are over an arm span around. We constructed the lake gazebo so that every part would work harmoniously with one another. The blue tile roof on top makes the lake gazebo a unique and visionary building. It gives off an elegant demeanor while keeping true to Korea’s traditional style of artistry. On the stone pillars beneath the lake gazebo, we sculpted the animals mentioned in Isaiah chapter 11. The scripture depicts various animals such the lion, eagle, wolf, goat, giraffe, deer, ostrich, peacock, and sheep as people with different personalities, nationalities, and religions that become one and fulfill an ideal world of love and peace. Initially, we were thinking of placing the gazebo on Donggeurae Mountain in the lake, but at that time, when we were building the gazebo for the lake, the Holy Spirit inspired Pastor Jung Myung Seok to return to Wolmyeongdong. He was out on a regional tour around Korea but returned just before he was about to finish. Ultimately, the architect told Pastor Jung that he would burn all of the small logs ordered for the gazebo and leave the next day without receiving payment. Pastor Jung told him that if he did something like that to God’s building, he would be in big trouble, so Pastor Jung asked him to listen and said that they should both accept their faults, have a meal together, and discuss. After the meal, they discussed about the gazebo again. Pastor Jung said that he wanted to erect the gazebo they were currently building in Donggeurae Mountain where he used to pray and that he wanted to build a bigger one in the lake. The architect told Pastor Jung that it would take more time but that he would build it. In the end, we were able to build them both at a cheap price. When we started building the gazebo in the lake again, Pastor Jung prayed to God to give really high quality logs for it. At that time, the architect asked Pastor Jung to go with him to look at the logs, so they went to Naju to look at logs. When they went there, there were some logs, but the owner of the lumber company said that the good lumber had not come in yet and that if good ones did come in, he would let Pastor Jung know. At that moment, Pastor Jung asked the owner, “What about those?” pointing at the bigger logs. The owner told him that he had incredibly big timber there. So Pastor Jung said he would take them and signed the contract right away. The classical building architect told him that if he used those big logs to build the gazebo, it would look like a woman with thick legs, so it would not look that great. The architect said he would do his part and build it but that after he was done, he would not be responsible any longer even if Pastor Jung regretted using such big logs. When Pastor Jung said that he wanted bigger logs than that, the architect laughed. In the end, Pastor Jung used bigger logs for the lake gazebo. Afterwards, he heard that the timber he got was supposed to go to another company, but the owner made a mistake and gave the best quality timber to Wolmyeongdong instead. Although Douglas Firs are known for producing the best logs, the workers said that they bought better logs than Douglas Firs and that it was really great wood. They were surprised and asked how Pastor Jung was able to buy such great quality wood. Most gazebos have pillars that are 35 cm in circumference, but we used ones with a 60 cm diameter. If you look at the gazebo from inside the lake, 35 cm seems to just right, but if you look at the gazebo from outside the lake, from the sports field, 60 cm is actually the right size. This makes sense because the distance from the sports field to the lake is over 50 m. It’s like if you look at a chubby woman from 50 m away. She would look thin. Lastly,we made the whole gazebo by peeling, trimming, and assembling everything out of wood. If you look at the rail, you will see that we used nails made from wood rather than iron. If we used iron nails, they would rot the log, so we used nails made of wood. After we built everything completely, the classical building architect said that he really liked it when he looked at the gazebo from outside the lake. He added that it was the most beautiful gazebo in Korea. Out of all the gazebos he had seen in Korea, he said this was the best masterpiece. While Pastor Jung was evangelizing overseas, another pastor who had interpreted for him introduced the architecture to Pastor Jung. She had bragged to the architect that the Wolmyeongdong Recreation Center was building buildings and gazebos in Wolmyeongdong. When the architect heard that, he said, “I’m an expert gazebo builder in Korea.” So that’s why she introduced him to Pastor Jung. After seeing Pastor Jung, the architect said that he wanted to help. That is how he came to build the gazebo. It was truly Jehovah Jireh. They finished the lake gazebo and the gazebo on Donggeurae Mountain after all these events.